We are going to modify a cheap cell phone to charge off of solar power. Here are the items you will need. 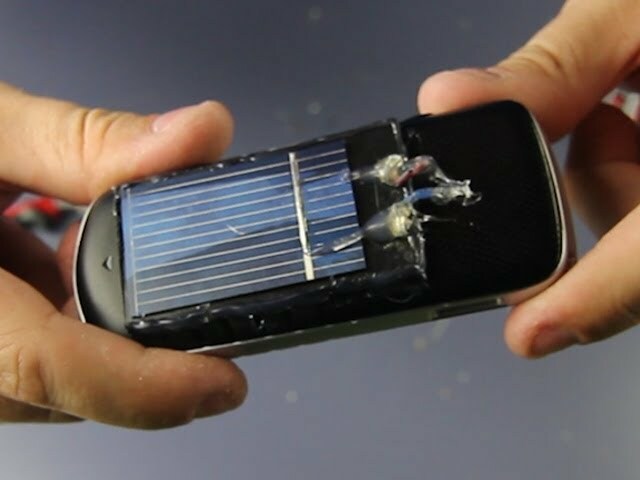 Attach the solar panel to the back of the phone with hot glue or epoxy. You can then burn a couple holes in the case with a soldering iron to run the wires through. Next, burn some grooves into the plastic phone molding so that we can store the wires without them stopping the phone from closing. Solder the positive output of the solar panel to the diode, make sure you wire it to the back end of the diode, you can tell which side is which by looking at the diode itself. Diode's have a single white line on the end which designates the front, so just wire the solar panel to the side without the white line! Next, wire the other side of the diode to the phone's positive battery prong (this should be marked on the phone itself). When that is done take the negative end of the solar panel and wire it to the negative battery prong on the phone. Now pop in the battery and close up the phone! Your cheap emergency phone is now ready for action! Thanks to all of you for your support and thank you to Squarespace for helping to keep this show going! Check them out at: and use the code science9 for 2 weeks free and 10% off your order! . why did u use diode..
phone cases? maybe like duck tape cases or something? This site is still under construction ! Is Fusion Energy Close To Becoming A Reality?